Newnan, GA – Emails obtained by Unicorn Riot through a public records request to the Coweta County Sheriff suggest that law enforcement relied on false ‘alt-right’ posts in their planning for an April 21, 2018 rally by the neo-nazi National Socialist Movement (NSM). The NSM ended up only drawing about 30 supporters but were met by several hundred anti-racist counter-protesters. Most media coverage of events in Newnan focused on the police response, which included over 800 officers who aggressively attacked and arrested antifascists, at times directly threatening protesters with assault rifles at point blank range. Evidence shows that the heavy-handed tactics used by Newnan police on April 21 were motivated in part by disinformation, created and shared by members of a far-right militia, which law enforcement had accepted as fact. The emails we received show correspondence between the Coweta County Sheriff, the Newnan Police Department, Georgia state police and the Georgia Sheriff Association. Repeatedly forwarded between Georgia law enforcement ahead of the April 21 nazi rally was a text copied from Facebook, which made several false claims regarding the counter-protesters coming to Newnan to oppose white supremacists. While none of these claims in the post came to pass, or seem to have been credible in the first place, the misinformation nonetheless ended up in planning materials for a major law enforcement operation involving over 800 officers from dozens of agencies. In the lead up to the neo-nazi rally and larger counter-demonstration on April 21, members of Newnan law enforcement seem to have internalized the scenario described in the Facebook post and were imagining themselves facing down a violent invasion. “Don’t guess these folks have heard of TEAM COWETA!!!! !,” Lieutenant Colonel Tony Grant wrote as he forwarded an email containing the text of the post to seven of his colleagues the morning before the rally. Grant, who appears to have taken the misinformation-laden Facebook rant at face value, acts as a director of logistics for the Coweta County Sheriff. While city officials have refused to disclose the source, the original Facebook post seems to have come from Newnan resident Clay Perry, whose Facebook profile contains several posts indicating affiliation with the ‘Three Percenter’ militia that provided security for the “Unite The Right” rally in Charlottesville. Perry’s screed was then shared by a large Facebook page called ‘III% Security Force Intel’. 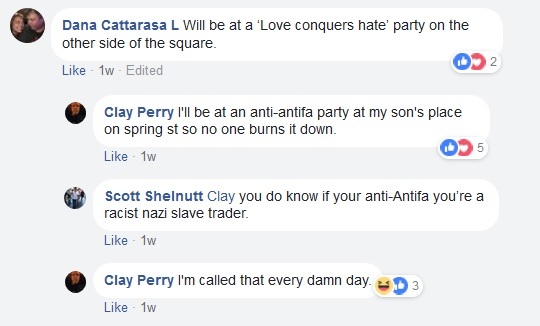 Facebook posts first pointed out by Atlanta Antifascists also show that Perry has described himself as “anti-antifa” and in August 2017 claimed that “actual nazis & white supremacists…were the vast minority of rally attendees” in Charlottesville. Additional information provided to the author of the blog Restoring the Honor shows that Newnan Police Chief Douglas “Buster” Meadows’ claim that he was “expecting 8,000 – 12,000 protestors, based on information reportedly released by Antifa” actually referred to a Facebook post on the page Valdosta Antifa. 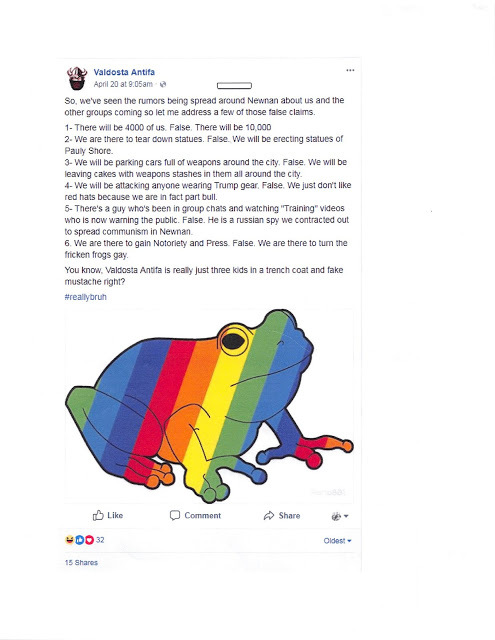 The post which was apparently used in law enforcement planning for the NSM rally included statements such as “we will be erecting statutes of Pauly Shore” and “we are there to turn the fricken frogs gay.” The Valdosta Antifa page does not represent any known antifascist group, and it has been shown that far-right operatives and internet trolls often create fake ‘antifa’ pages. 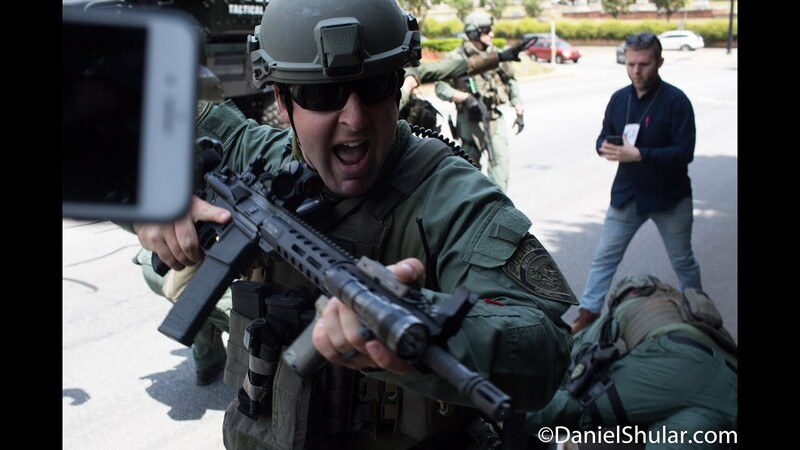 The bizarre internet rumors that ended up fueling militarized protest policing in Newnan fit into a larger pattern of state and federal police intelligence analysts citing alt-right websites as credible news sources. Intelligence prepared for law enforcement also tends to focus on anti-racists and downplay threats posed by neo-nazis and other racist groups. A recent Unicorn Riot investigation found that a Tennessee Homeland Security analyst described the neo-nazi Traditionalist Worker Party as “not the issue” despite the group’s well-documented history of organized violence. Read the Coweta County Sheriff emails for yourself below, click to download the .PDF files (part one, part two) or check out the request page on Muckrock.com.